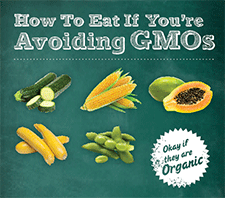 GMO 101 : What you need to know! Organisms whose genetic makeup (DNA) has been altered in a way that does not occur naturally. Why was GMO created in the first place? How is GMO in our food? Why do so many packaged foods have GMOs? 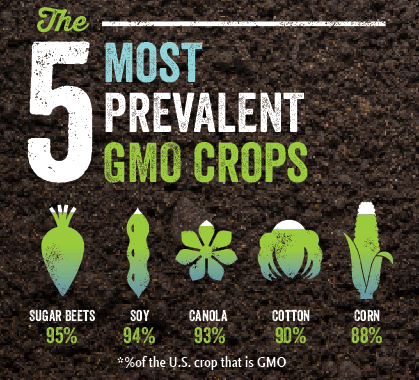 These five most prevalent GMO crops end up as ingredients in all kinds of packaged foods as corn syrup, oil, sugar, flavoring agents, thickeners, etc. More than 85 percent of the corn and soy grown in the United States comes from seeds whose DNA has been reengineered (to increase yields) and those two crops play starring roles in countless processed foods, from soda to salad dressing to bread. Hence, over 70% of packaged food products in North America contain GMOs. That means any of the following food items can contain GMO: Ketchup, chewing gum, cooking oil, soda, baking extracts, pickles, brown sugar, salad dressing, fruit juices, yogurt, can soups, pasta sauce, bread, mayonnaise, sugar, infant formula, cereal, margarine, crackers, cookies, chocolate, candy, fried food, chips, veggie burgers, vegetarian protein, ice cream, frozen yogurt, soy sauce, soy cheese, tomato sauce, protein powder, baking powder, alcohol, vanilla, powdered sugar, peanut butter, enriched flour and pasta. Produce you should consider getting organic? What impact do GM foods have on our health? The answer is, no one really knows. Most modern day illnesses can be linked to the sheer GM foods. GM foods have been on the market only since 1994, and research on their long-term effects on humans is scarce. To date most of the studies have been done on animals. Worryingly though, some of those studies link GM foods to altered metabolism, inflammation, kidney and liver malfunction and reduced fertility in animal studies. What can we do to shield our families? It is not always possible to buy everything organic. To best shield your family from GMO, make sure you buy only organic corn, hawaiian papaya, zucchini, yellow summer squash and edamame when possible. Avoid non-organic processed foods and canola oil. Choosing organic produce is the best way to avoid GMO foods since GMO produce cannot be labelled organic. PS: Non-GMO brands I like are Organic valley, Applegate and Annie’s. For high heat Indian cooking, Peanut oil and Safflower oil are a good choice. Canola oil is a no no! Love your article. So glad others are concerned with GMO foods! Thank you, Bethel! Yes, GMO awareness is necessary! Good information. Keep up with good work.